Over Thanksgiving weekend, Steve and I went to Milwaukee. Our goal was to volunteer at Will Allen’s urban farm called Growing Power. Before our journey, I researched a variety of good options for locally sourced food. 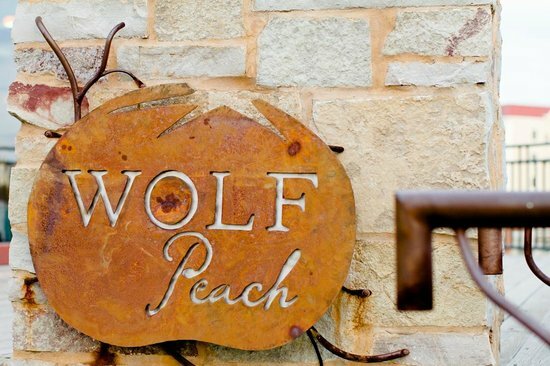 The restaurant that captured my attention was Wolf Peach. The unusual name that tells a story. According to their website, the scientific name for tomato translates, literally: Wolf Peach. Peasant food is something Steve has been talking about for awhile now, so I figured this was our chance to see how one restaurant interprets the concept. Local ingredients are the whole premise of the restaurant. It appears, by reading articles in the press, that they preserve tomatoes for use in dishes served this time of year. Many dishes have tomatoes incorporated into them in some form. According to the article I read, the restaurant has a farm in Sheboygan County, where they grow their own produce. If you are looking for meat that is raised on local farms, they mention Yuppie Hill Farms and Hometown Sausage Kitchen. The two of us shared a total of three small plates and one dessert. For a starter, we had a chickpea bruschetta, with preserved lemon, garlic, and chile. It was very good and my first time to taste preserved lemons. The flavor drew out my curiosity without overpowering my senses. The next item was pan seared shishito peppers with romesco. When I got home I looked up romesco and discovered it is a sauce made with tomatoes, garlic, roasted pepper, and nuts. I think it also contained smoked paprika. When ordering I asked about shishito peppers. The wait person explained that they are mostly mild but that eating them would be a bit like playing Russian Roulette, because every once in a while a person gets a very hot pepper. We avoided the lurking loaded cylinder because all the peppers on our shared plate were pleasantly mild. The final small plate was wood-roasted broccoli, apricot with calabrian chile and almonds. This dish took the flavor scale over the top. We soured to new heights of broccoli love. Who knew broccoli could taste so good? For dessert we had an excellent, but maybe just a tad too sweet rice pudding. The decor was a pleasant surprise. It is rustic with rough woods elements and community high top tables. That goes with the peasant food theme. 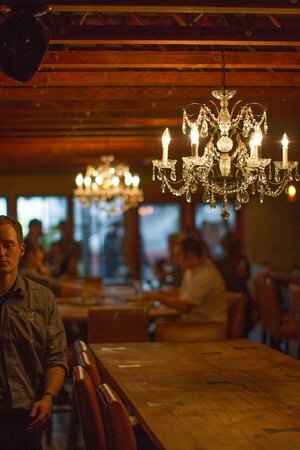 But just when I thought I had the decor figured out, I turned to see a crystal chandelier hanging above our table. It is whimsical and makes me think the peasants stole a chandelier from a nearby manor house. When I arrived Friday night without a reservation, I was prepared to be turned away because the place was buzzing. The host was very helpful. He invited me to go downstairs and decide if we would want to sit at the bar but order the full dinner menu. When I checked it out and suggested Steve park the car, I wondered if the downstairs host might have other opinions about the two of us showing up. She was equally friendly and suggested we sit at a community table. We joined a table with seven diners as our wait person arrived. She was helpful by explaining their service concept of “Como Viene” which means “as it comes.” The food and conversation flowed which made for a fun evening. There are a lot of farm-to-table or locally sourced options in Milwaukee. I am sad that I didn’t get to try more, based on our time frame. However, I am supremely happy with our whimsically romantic evening of good food and lovely laid back service at Wolf Peach. The affordable pricing for ample small-plate portions that can be shared by two or more diners. If you are dining with people who choose different types of diets, there is plenty to choose from for all: vegans, vegetarians and meat eaters. Join me on a virtual tour in honor of the farmers who supply locally grown produce to three of the restaurants we’ve reviewed from California to Arizona and then on to Arkansas. The dedication farmers give to their work can not be measured in dollars earned. For me, it is so easy to lose my connection to the land and forget how hard it is to grow food. So today, I want to give reverence for the bounty all farmers produce. For them it is not about preparing for some odd Thursday in November, instead, they just keep giving to us all year long. Even those of us that live in the cold states, we still get to enjoy apples and root veggies this time of year. Since it is November, let’s start in warm and sunny Napa Valley and take a peek at the garden that grows right outside a restaurant. This special place has two acres that provide 20 percent of the restaurant’s produce year-round and inspiration for the restaurant’s culinary team. Francine visited Mustards Grill: Napa Valley, CA and provided a review. She snapped the above picture of the garden. I am glad I went on this virtual farm tour because I got a chance to read the blog of from Sunizona Family Farm. This picture comes from a blog post about the day a team of three guys harvested over seven tons of spaghetti squash in one day. Check it out, it is quite impressive! The Root has a whole list of farmers on their website. 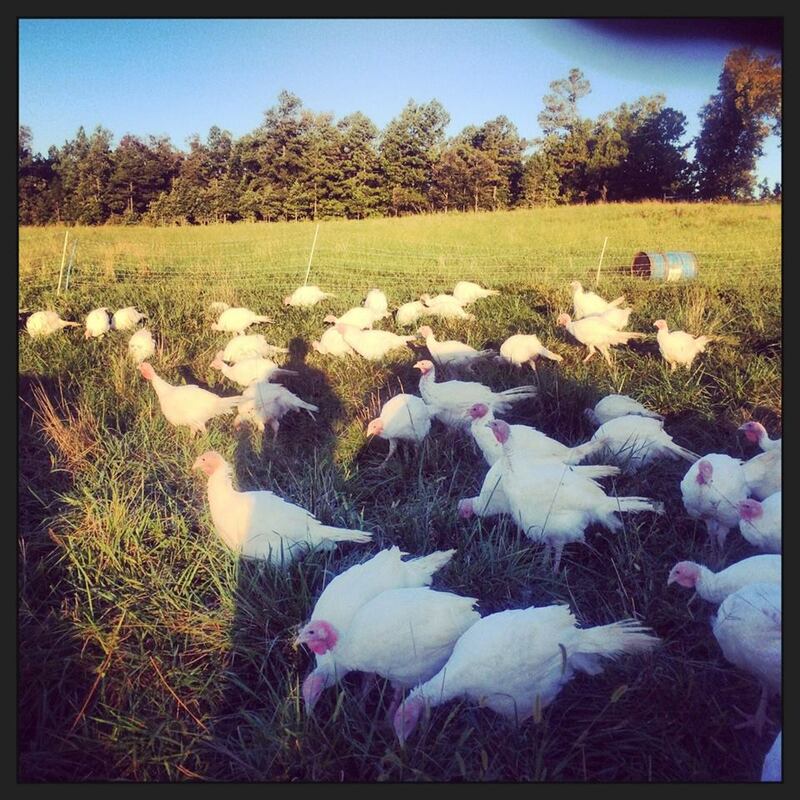 For you meat lovers out there who are joining this virtual tour, I selected Falling Sky Farms and a picture from their facebook page that shows the turkeys growing earlier this fall.